I've been working on a few 'secret' knitting and crochet projects in the last week, so there's nothing I can show you today. However I can tell you that Little Miss recently put in a request for 'something snuggly'. She likes lots of colour and anything made for her has to be very soft - her skin is irritated by labels, loose threads, or anything that is even slightly 'scratchy' and wool can leave her with some redness and irritation if worn next to her skin. 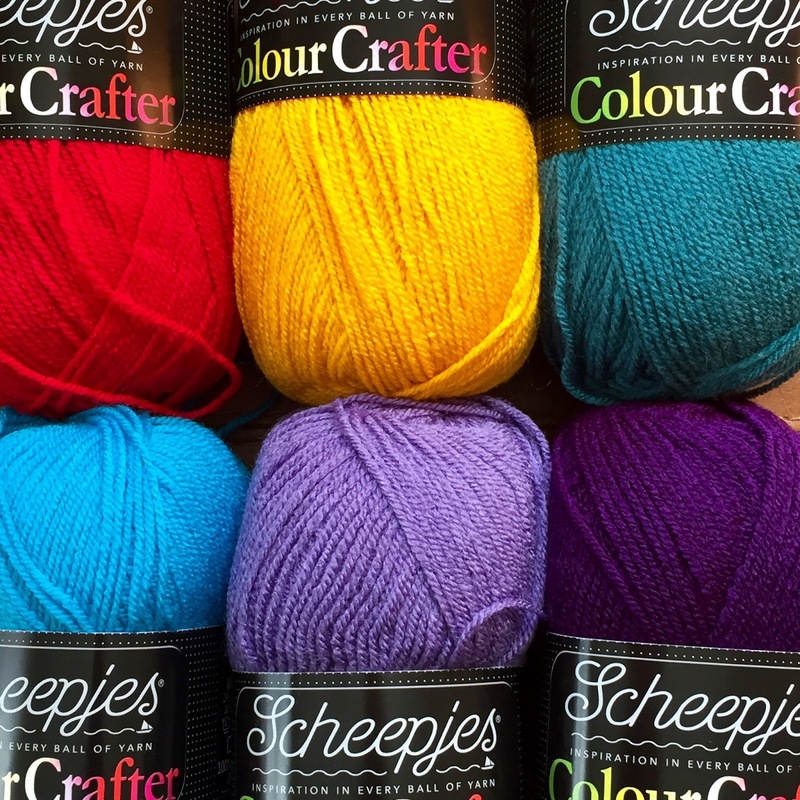 This seemed like the perfect opportunity to try the new Colour Crafter yarn from Scheepjes. This 100% premium acrylic DK yarn (which retails at £2.39 per 300m/100g at Deramores*) comes in 63 vibrant shades, all named after places in the Netherlands. As I wanted something inexpensive, hardwearing, washable, and soft, it seems to have been a good choice. It also has the added benefit of being neither splitty or squeaky - two of my pet hates. It is a good option for children's clothing and blankets - in fact, with all of those colours, I'm sure it will be very popular for blankets! Little Miss is delighted with the colours we ordered, particularly the red and light purple, and with 600g I'll have enough to make more than one item. I did a bit of swatching already, but want to try out a few other ideas before casting on, so I'm not going to show you any more for now, but will post an update/ progress pics on Instagram as I go along. As I'm attempting to restore some normality after the half term holiday, that's all for today but I'll be back soon with more Festive Gift Guide ideas and a downloadable summary of the Rock Those Chevron Socks knitting pattern. With the children back at school, I'm also planning to get back onto Periscope this week. If you follow my profile and allow notifications, you'll get a message when I'm broadcasting and can watch live or via reply within 24 hours. Hope to see you there! Oooh, watcha making? I agree: absolutely perfect for blankets! !